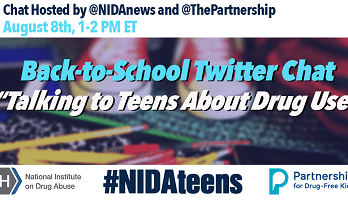 Join us on Wednesday, August 8 from 1:00 p.m.-2:00 p.m. EDT as we co-host with the National Institute on Drug Abuse (NIDA) an hour-long Back-to-School Twitter Chat. Participating with the Partnership and NIDA are the CDC Division of Adolescent and School Health, Child Mind Institute and Students Against Destructive Decisions. We will be joined by other Institutes from the National Institutes of Health to share information and practical tips on talking with your children about substance use as they head back to school. We’ll discuss what you should know about vaping and e-cigarette use, what you can do to safeguard against prescription opioid misuse, how to intervene if you suspect your child may be misusing substances, and much more. Make sure to follow @thepartnership as we moderate the Chat and use the hashtag #NIDAteens to follow the conversation and ask questions.